Artificial intelligence (AI) is revolutionizing the banking sector by detecting fraud in financial transactions on the basis of a pre-defined set of rules. In 2018 AI in banking business was estimated to be $41.1 billion, which includes the cost savings and efficiencies of introducing AI technology compared to keeping existing infrastructures and processes. With the projected increase in the number of AI projects that are launched and become commercially deployed, the business value of AI in banking is projected to reach $300 billion by 2030, according to global business information provider IHS Markit (NASDAQ: INFO). According to Artificial Intelligence in Banking Report by IHS Markit, North America is projected to be the largest market for AI in banking between 2018 and 2023. AI in the region will increase from a business value of $14.7 billion in 2018 to nearly $79 billion by 2030. 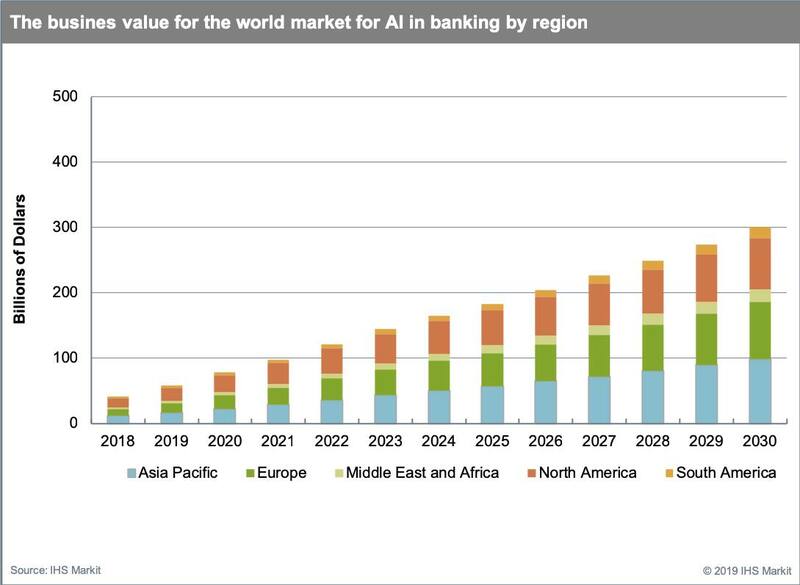 However, the proportional importance of the North American region is likely to decline between 2024 and 2030 as Asia Pacific, Europe and other global regions roll out more AI solutions in the banking sector. Asia Pacific is the second largest region employing AI in banking, increasing from a business value of $11.5 billion in 2018 and rising to become the leading region in 2024, with a business value of $50.6 billion. By 2030, the Asia Pacific region for AI in banking is projected to reach $98.6 billion by 2030. “Countries like China, Japan, South Korea, Hong Kong and Singapore are likely to drive the demand for AI within the banking sector over the next ten years,” Tait said. The introduction of AI technology is not entirely good news for the banking industry, with job losses and job re-assignments expected as AI increases enterprise productivity. IHS Markit estimates that by 2030, around 500,000 bank workers in the United Kingdom and 1.3 million in the United States could be affected. If this is mirrored across all countries globally, then there will be tens of millions of banking and financial services jobs impacted by the introduction of AI technology in the coming decade.